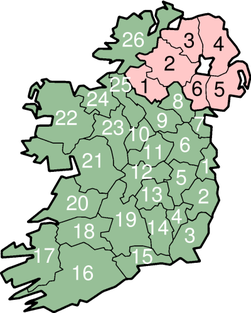 Ireland is a sovereign state which covers approximately five-sixths of the island of Ireland, off the coast of north-west Europe. The state's constitutional name is Ireland and this is how international organisations and residents usually refer to the country. It is a member of the European Union, has a developed economy and a population of almost 4.6 million (2011 census). The remaining sixth of the island of Ireland is known as Northern Ireland and is part of the ► United Kingdom. Is stát í Éire ar an gcuid is mó d'oileán na hÉireann, amach ó chósta thiar-thuaidh na hEorpa. eIs le Tuaisceart Éireann, atá laistigh den Ríocht Aontaithe, an chuid eile den oileán. Éire an teideal oifigiúil atá ar an stát as Gaeilge – leis an gcur síos oifigiúil (Poblacht na hÉireann). Cé gur fhan an Phoblacht neodrach le linn an Dara Chogaidh Domhanda agus cogaí eile ó shin, is ballstát de na Náisiúin Aontaithe agus den Aontas Eorpach í, ach ní dheachaigh sí isteach in ECAT, ar eagraíocht míleata é. More images Ireland - Ireland (Category). This section holds a short summary of the history of the area of present-day Ireland, illustrated with maps, including historical maps of former countries and empires that included present-day Ireland. This page was last edited on 3 June 2016, at 23:19.